But due to health concerns it is probably a good time to make a change. 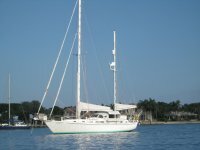 She is a 1981 42, hull # 221 built in Fort Myers. Eight cabin fans, 20K Ocean Breese Air Conditioner with electric heat . Fuel capacity 168 gal in three tanks, Water 200 gals.